A lot of people have asked about this recipe of late, so I thought it was time to share it. It is so simple and looks so good too. It's great for Super Bowl parties, potlucks, etc... Kids really love it too. In a skillet brown the ground beef and onion. Drain. Add taco seasoning and green chiles. Simmer 5-10 minutes. Drain again so there is no excess moisture. I use my stoneware pizza stone. Lightly spray it with PURE. Unroll the crescent rolls and separate them. Arrange the rolls (wide edges inward with the thin corner edge slightly hanging off the pizza stone) in a circular pattern around the pizza stone with the corners slightly touching. 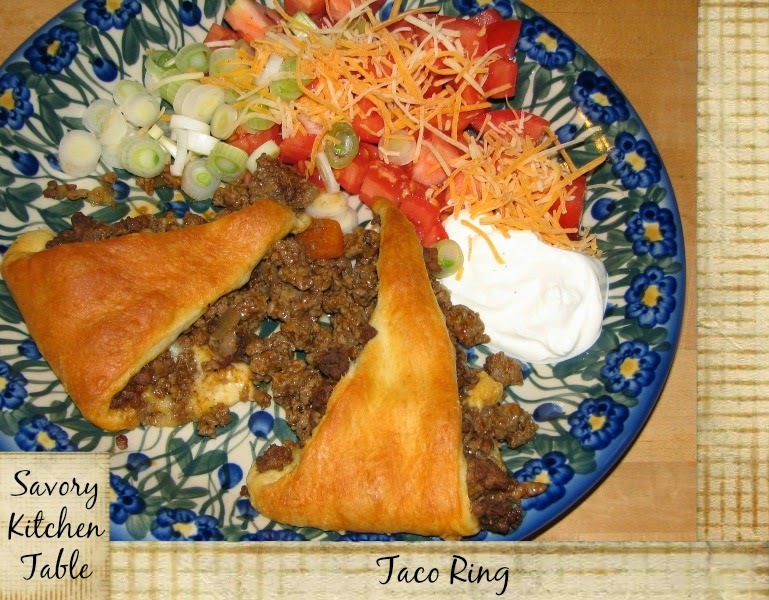 Arrange the meat mixture in a circular pattern covering the large end portion of the crescent rolls. Sprinkle 1/3 -1/2 of the cheese over the meat. Pull the small pointed end up over the meat mixture and pinch into large portion creating a ring that resembles a wreath. You will have an open area with meat showing through. Bake according to the biscuit directions and golden. I also serve it on the stoneware. Arrange the shredded lettuce, green onions and tomatoes in the center and edges. For just us, I just put it directly on the plate. Garnish with sour cream and remaining cheese.